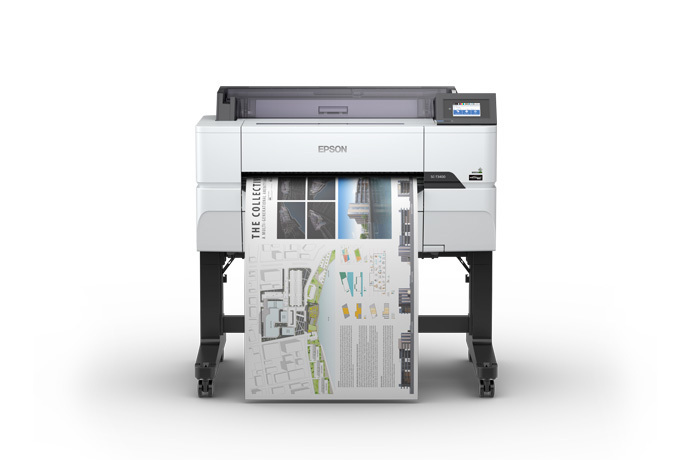 Epson Further Expands SureColor T-Series Wide-Format Printer Line with Two High-Production Wireless Workgroup Printers | Industry Analysts, Inc.
CHICAGO (PRINT, Epson Booth #3121) – Sept. 27, 2018 – Epson today announced it is continuing the expansion of its wide-format technical plotter line – the SureColor® T-Series. The new 24-inch SureColor T3470and 36-inch SureColor T5470 are ideal for high-production printing of blueprints, line drawings, and posters. Leveraging a compact and modern design, these easy-to-use wide-format wireless printers feature an intuitive touch screen and offer advanced network security and encryption designed to safeguard information. Complementing the SureColor T-Series lineup, including the recently announced SureColor T3170 and T5170, the new models are built to meet the demands of professionals and workgroups across a range of segments with high-production printing needs, including architecture, engineering, CAD, GIS, education, and corporate offices. The SureColor T3470 and SureColor T5470 tout Epson’s latest PrecisionCore® MicroTFP® printhead delivering Precision Droplet Control for outstanding photographic images, precise lines, and crisp text; producing an A1/D-size print in as fast as 25 seconds1. Ideal for robust printing, high-capacity UltraChrome® XD2 ink replacement cartridges help increase productivity and produce durable, vibrant prints. The new printers are the first SureColor T-Series printers to provide advanced network security and encryption features designed to safeguard sensitive information. Leveraging integrated wireless and Wi-Fi Direct® connectivity, users can seamlessly print from tablets, smartphones and more2, router-free Wi-Fi Direct® printing3 and printing directly from a USB or thumb drive the SureColor T3470 and SureColor T5470 offer convenient PC-free printing for high-production offices. The SureColor T3470 (MSRP $2,295) and T5470 (MSRP $2,995) will be available later this month and offer a standard Epson PreferredSM Limited Warranty. The Epson SureColor T-Series printers are designed to work exclusively with Epson UltraChrome XD2 ink*. For more information, visit https://epson.com/surecolor-t-series-plotters. 1 SureColor T5470 prints A1/D-size prints in as fast as 22 seconds. SureColor T3470 prints A1/D-size prints in as fast as 25 seconds. Print speeds are based on the print engine speed only. Total throughput time for any print depends on workstation configuration, file size, print resolution, ink coverage, networking, etc. Actual print speeds will vary. EPSON, SureColor, PrecisionCore, MicroTFP, and UltraChrome are registered trademarks, EPSON Exceed Your Vision is a registered logomark and Epson Connect is a trademark of Seiko Epson Corporation. Epson Preferred is a service mark of Epson America, Inc. Wi-Fi Direct® is a registered trademark and Wi-Fi CERTIFIED™ is a trademark of Wi-Fi Alliance®. All other product and brand names are trademarks and/or registered trademarks of their respective companies. Epson disclaims any and all rights in these marks. Copyright 2018 Epson America, Inc. This entry was posted in Epson and tagged Epson, print, SureColor, T-series, T3470, T5470, wide format by IA Staff. Bookmark the permalink. ← Previous Previous post: PRINT 18, Day 1 & Day 2 Videos From RSA!